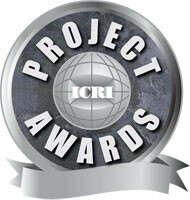 News - Premier Corrosion Protection Services, Inc.
October 1, 2015 - For the fifth year in a row Premier has won an award from the ICRI (International Concrete Repair Institute). This year we won the Award of Excellence for the repairs to a mix box at a pulp and paper mill. The mix box, a 106' long, 13' wide and 9' high concrete trough was repaired and lined with FRP in five days. Please see the article below for more details. Congratulations to all those involved! October 1, 2014 - This Year we have been awarded the ICRI Award of Merit for the repairs to the to a Loading Dock at Port Tampa Bay. This is our 4th year in a row that Premier has won an award from the International Concrete Repair Institute. Congratulations to all those involved! September 1, 2013 - We have just been notified that for 2013 we have been awarded the ICRI Award of Excellence for the repairs to the CSX Rockport Terminal loading dock. This make three years in a row that Premier has won an award from the International Concrete Repair Institute. Please click on the link below to download the article from the Concrete Repair Bulletin regarding this award. August 28, 2013 - We are pleased to announce that Premier has been selected to be featured in Kiewit Infrastructure's Monthly magazine for outstanding safety practices. September 1, 2012 - We are pleased to announce that we received the 2012 ICRI Award of Excellence for the repairs to an intake structure at Progress Energy/Duke Energy Crystal River Facility. September 1, 2011 - We are proud to announce that Premier has received the 2011 Award of Merit from the International Concrete Repair Institute for our repairs to the Covanta Energy Cooling Tower rehabilitation project. Please click on the images below to view our Premier Newsletters. Underwater bridge pile repair and strengthening with CFRP. 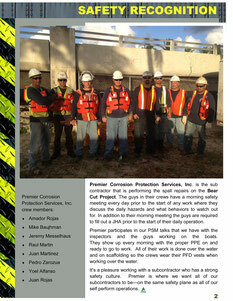 Premier performed the repairs to the Bayview Bridge in Fort Lauderdale, FL using Quakewrap products. Following is a video demonstrating the repair. The following video is filmed by Mapei, the material supplier for the repairs at the JEA Northside Generating Station in Jacksonville where Premier rehabilitated and strengthened an access road/bridge.